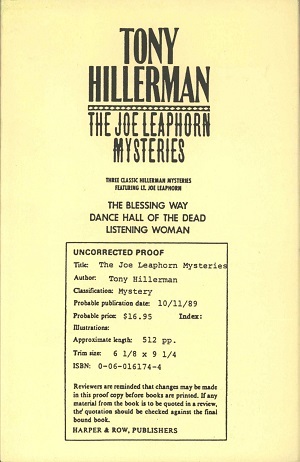 This is the advance reading copy of The Joe Leaphorn Mysteries, which was printed in 1989 by Harper & Row in New York City, New York. The Joe Leaphorn Mysteries: Three Classic Hillerman Mysteries Featuring Lt. Joe Leaphorn is the first anthology of the first three novels in Tony Hillerman's Navajo Mystery Series. Format: Paperback, 20.9 x 13.5 cm. Binding: Tan paper covers with the title, author, and publisher printed in black on the spine.